I have a theory. 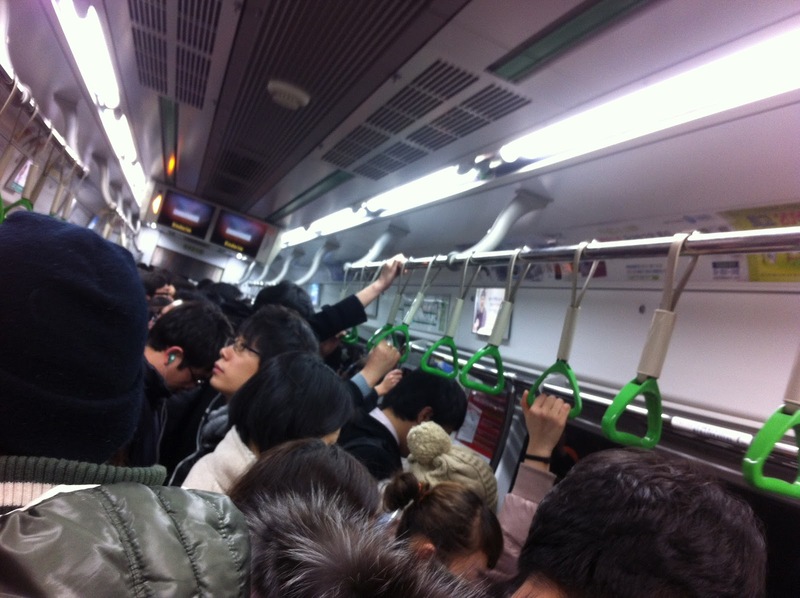 It goes like this; Korean subway = good, Korean passengers = bad. London Tube = bad, London passengers = good. In London, the underground (or tube if you will) is crap. It's dirty and small. It's unreliable. It's horrendously expensive, in fact it's stupidly overpriced. It's old. It's actually the oldest underground in the world, and sometimes it feels like it's not been changed since it was opened in 1863. The men who dug the tunnels (yes DUG, by hand) went on to dig the tunnels of the Somme in WWI. That's a fantastic bit of history and incredibly impressive, however that was over 100 years ago. Shouldn't we have updated a little more since then? On the tube you can't use a mobile phone, a blessing really as people tend to talk really loudly on their phones in London. There's no air conditioning in the summer and you can't walk from one carriage to the next. Some of the stations (particularly Bank as it's on a bend) have MASSIVE gaps between the train and the platform. In fact I once saw a little girl fall through to the tracks. Thankfully a quick reacting passenger pulled her back up in time. Having said that, the people on the tube, on the whole, are pretty polite. Now I'm sure there are many Britons who will scoff at this declaration. I challenge them to use the Seoul Subway and not come away with the same opinion. On the tube, even in rush hour, I have never ever felt someones fist in my back hurrying me to get on. NEVER EVER. If that happened in England there would almost certainly be a fight. and with good reason. That is incredibly rude and impatient. On the tube people generally wait until passengers have disembarked before getting on. This make sense, to me anyway. Generally people don't lean on you, fall asleep on your shoulder, stamp on your food, elbow you in the ribs, squash your hand onto the bar, so even if they do a 'sorry,' will probably follow. People don't push, unless they're in a rush, and even then a simple 'Excuse me' is suffice to get the space you need to get past. Obviously I'm not deluded enough to think that everyone using the tube is like this. But the majority are, and I hazard a guess that many of the ones who aren't are probably from a culture akin to Korea or China's. The metro in Seoul is fantastic. It's clean, cheap and new. It's incredibly reliable. You can use your mobile and the free wi-fi. There's air-conditioning and heated seats. The carriages are huge. But the people on it are rude. No two ways about it. No 'cultural differences' excuses. They're rude. Even Koreans that I've asked say it's rude. They push, shove, lean on, elbow, stamp and stomp their way on and off. Nobody waits for anyone to get off. People literally run for a seat. If you leave a space between you and the door someone will stand in it. No matter how small that space is. They don't seem to realise or care that you are waiting to get off as well. And it gets packed! There are so many people using it. Especially on the circle line, which is the one nearest to me. At rush hour it's crazy, no one says excuse me and no one readily moves to let other people on so when it's busy everyone shoves. And you usually end up with your face in someones back, or worse in their hair. So unpleasant. It gets busy on the Tube but it's no where near as cramped as in Seoul. 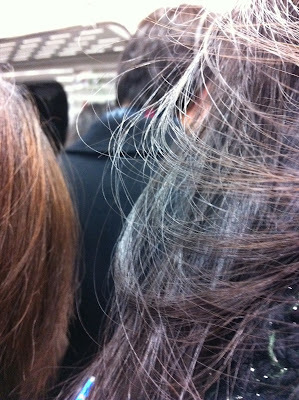 My view at rush hour. As I said, if you ask a Korean (and I have) they say that they don't like it, but they shrug 'That's just how it is,' That as it may be, but if you don't like it you should change your ways, don't participate in it. A busy train on Line 2. The bus gets packed as well. 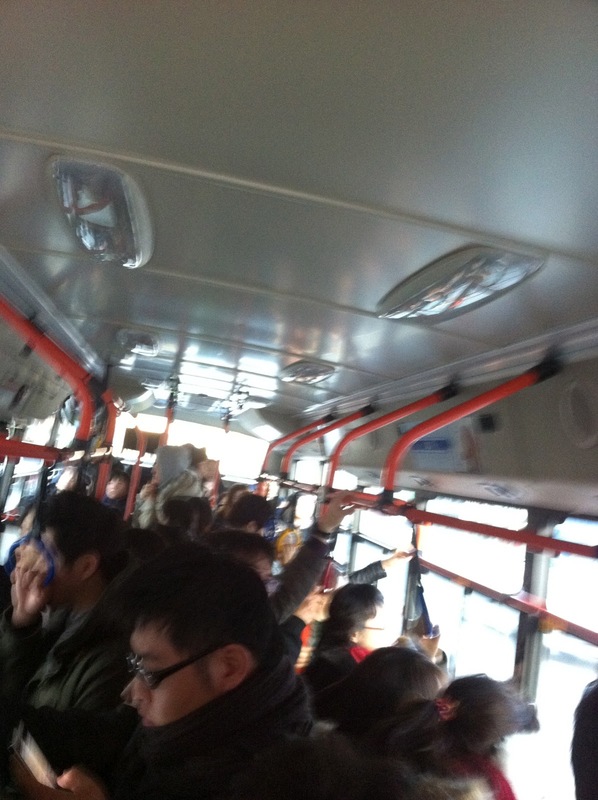 A funny story about the bus; When I first arrived I was chatting with my co-teacher about the bus and she was shocked that we have a limit of passengers allowed to stand and that the bus won't stop if it's full to capacity. When Mary was here she asked me "When do they stop letting people on?" and my reply: "When they can't close the door anymore," Seriously. This scares me every morning as I walk to the bus stop, literally a wall of people coming towards me.